Traditional metal daybed that exudes romance. Lovely choice for girls, teenagers and guest bedrooms. Detailed oval finials add to the appeal. Luxury enamel black gloss finish. The dimensions of the Florida metal day bed are: H114.5 W95.5 L198 cm. 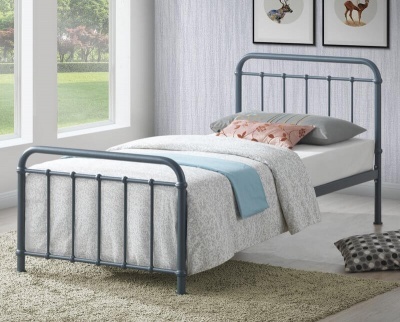 This daybed has an under-bed storage clearance space of 35 cm. When used with a valance sheet you can create valuable hidden storage space under the bed. Delivered in four boxes. Flat packed for home assembly full instructions included.